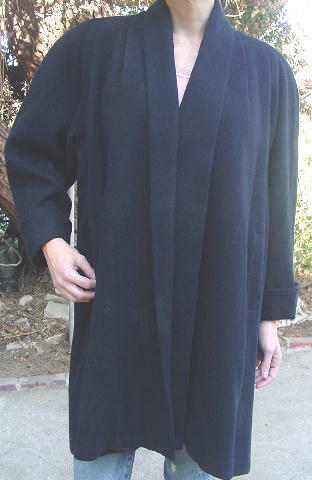 This black 80% wool and 20% nylon coat was made in the USA by bebe. 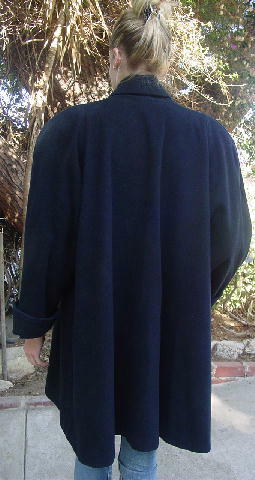 It has a black full lining, built-in shoulder pads, and 3" wide sleeve cuffs. 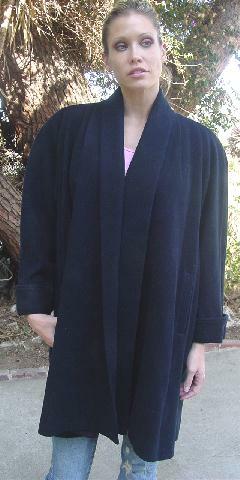 The lower front has two vertical pockets. The tag says 1, which we presume is a 1X. It fits like a L/XL. shoulder to shoulder (angled seam to seam) 12"
shoulder pad to shoulder pad 21 3/4"
shoulder seam to end of sleeve cuff 25"
bottom hem side to side 37 1/2"